Popular with the Landsknechts "German mercenaries" during the 16th century. This lightweight Burgonet is characterized by a high combed skull, brow peak, hinged ear pieces and blackened sections. This functional 16th century light Burgonet Helmet is characterized by it's high combed skull, brow peak and hinged ear pieces. 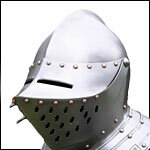 The Jousting Close Helmet has a full visor and bevor completely covering the head. Historically accurate and functional. Quality German Pappenheim Helmet 17th Century is functional, made from 18 gauge steel and is available with a standard 23 ½" head circumference. Our functional Lobster Tailed Helmet 17th Century is made from 18 gauge steel and is available with a standard 23 ½" head circumference. A development of the medieval kettle hat and also used by the infantry this functional Comb Morion Helm has a large central comb and wide brim. The Renaissance Close Helmet has a full visor and bevor completely covering the head.